Naval facility under construction in Djibouti shows Beijing’s ambitions to be a global maritime power and protect its expanding interests abroad. It was February this year when camel drivers first spotted the Chinese troops staking out a patch of coastal scrubland about 8 miles from the largest U.S. military base in Africa. Chinese navy ships had visited this tiny East African nation before. They sometimes picked up supplies in the old French port, farther down the arid coast, during antipiracy patrols off Somalia. This time, the Chinese military was here to stay. The camel herders watched as the troops secured a plot next to a construction site where a vast new bulk and container port is taking shape. The 90-acre plot is where Beijing is building its first overseas military outpost—a historic step that marks a bold new phase in its evolution as a world power. Due for completion next year, the naval outpost is expected to feature weapons stores, ship and helicopter maintenance facilities and possibly a small contingent of Chinese marines or special forces, according to foreign officers and experts monitoring its development. Its cluster of low-rise concrete buildings and shipping containers, some with Chinese flags, offers the most tangible sign yet of China’s strategy to extend its military reach across the Indian Ocean and beyond. In doing so, China is accelerating its transformation from an isolationist, continental nation to a global maritime power, a move that could challenge Western security partnerships that have underpinned the world order since 1945. 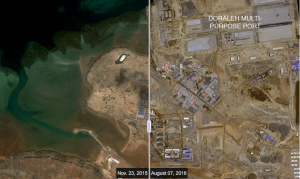 While Chinese officials deny plans to build large U.S.-style bases and call the Djibouti outpost a “support facility,” they also talk openly about negotiating more overseas outposts where Chinese interests coalesce. “Steadily advancing overseas base construction” is one of President Xi Jinping’s foreign-policy priorities, wrote Adm. Sun Jianguo, the deputy chief of the joint staff department and likely future naval chief, in a Communist Party magazine in April. The Pentagon has predicted China will establish several more outposts in the next decade. One likely spot is Oman’s port of Salalah, where Chinese navy ships often stop for rest and resupply, defense experts say. Other possibilities include the Seychelles and Pakistan’s port of Karachi. Officials from those countries didn’t respond to requests for comment on whether bases might be built there, nor did China.